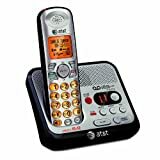 Vtech - CS6114 VTech CS6114 DECT 6.0 Cordless Phone with Caller ID Call Waiting White with 1 Handset - Cordless - 1 x Phone Line - Backlight VTECS6114 pg.1559. Vtech - CL80111 AT&T CL80111 Cordless Handset - Cordless - Black Black ATTCL80111 pg.1558. Vtech - LS6405 VTech LS6405 Accessory Handset for VTech LS64475-3 Silver - Cordless - Silver Black VTELS6405 pg.1558. Vtech - DS6101 VTech DS6101 Accessory Handset Silver - Cordless VTEDS6101 pg.1557.